Spend time asking, seeking, and knocking, listen for God’s reply, and be ready to respond to what He tells you. 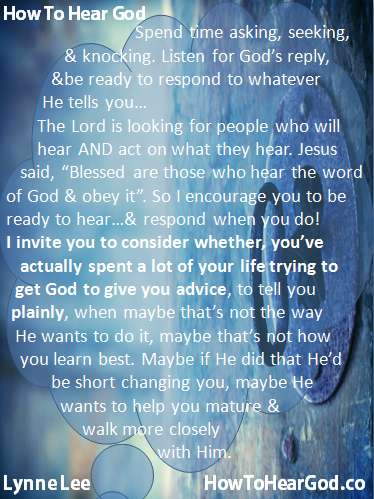 So I encourage you to be ready to hear…and respond when you do! I invite you to consider whether, you’ve actually spent a lot of your life trying to get God to give you advice, to tell you plainly, when maybe that’s not the way God wants to do it, maybe that’s not how you learn best. Maybe if God did that He’d be short changing you, maybe He wants to help you to mature and walk more closely with Him.